Instruments by the exceptionally prolific French violin maker Jean-Baptiste Vuillaume are renowned for their soloist-quality sound, their sophisticated imitation of classical Italian makers and their consistently high standard of workmanship. Born in 1798 into a family of violin makers in Mirecourt, Vuillaume apprenticed first with his father before moving to Paris in around 1818, where he worked for François Chanot and then later in partnership with Lété. His earliest labeled violin dates from 1823 and his last from 1875, the year he died, making his career one of the longest in the history of violin making. Vuillaume’s workshop, which he opened in 1827, employed many talented craftsmen, including violin makers Silvestre, Derazey, Buthod, Maucotel, Gemünder and Mermillot, and bow makers Persoit, Dominique and François Peccatte, Fonclause, Maline, Simon and Voirin. The sheer productivity of the workshop is staggering: during the 1830s Vuillaume’s inventory was assigned an average of 117 serial numbers per year, and in the year 1855 alone there were 160 serial numbers assigned. Altogether his inventoried instruments number slightly more than 3,000. Vuillaume was an innovator throughout his career, creating self-rehairing bows, the octobass, steel bows and a new style of frog with softer edges, which sat on a rounded track under the handle instead of abutting the bottom three facets of the octagon. Many great soloists play on Vuillaumes as their primary instruments, most notably Hilary Hahn and Vilde Frang, but also impressive is how many soloists of the past and present owned and played a Vuillaume as a back-up to their Strad or Guarneri. Very few Vuillaumes play poorly and most have a sound on which any soloist or orchestral musician would be happy to make a career. 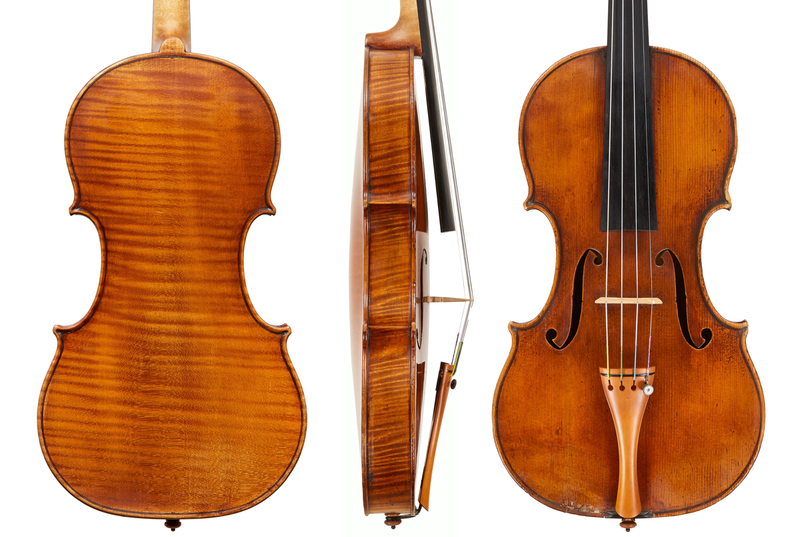 The ‘Sun-Law’ Vuillaume violin dates from c. 1855 and is built on a Guarneri ‘del Gesù’ model. As with other Vuillaumes, it is not a copy of a specific instrument: the outline of the body and the soundholes take inspiration from the 1735–37 period, while the head closely follows a pattern that ‘del Gesù’ was using in 1742. Guarneris from the mid-1730s are distinctive for their rounded upper and lower bouts, their short and high-set upper corners and their open, shallow C-bouts. 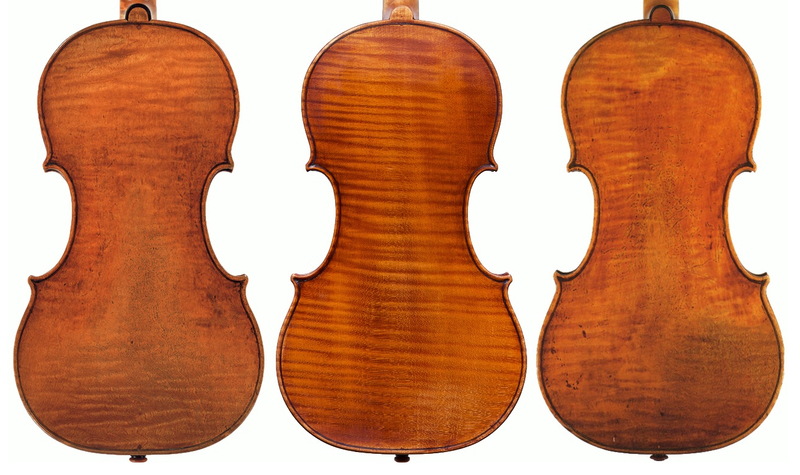 Of the Guarneri violins that came through the Vuillaume shop in the 1840s and 50s, the 1737 ‘ex-Panette’ and the 1736 ‘ex-Pollitzer, Koessler’ are close matches to the proportions of this Vuillaume. The soundholes in particular show the influence of the ‘Panette’, which was sold by Vuillaume in 1847 and from which he made frequent copies and took inspiration. 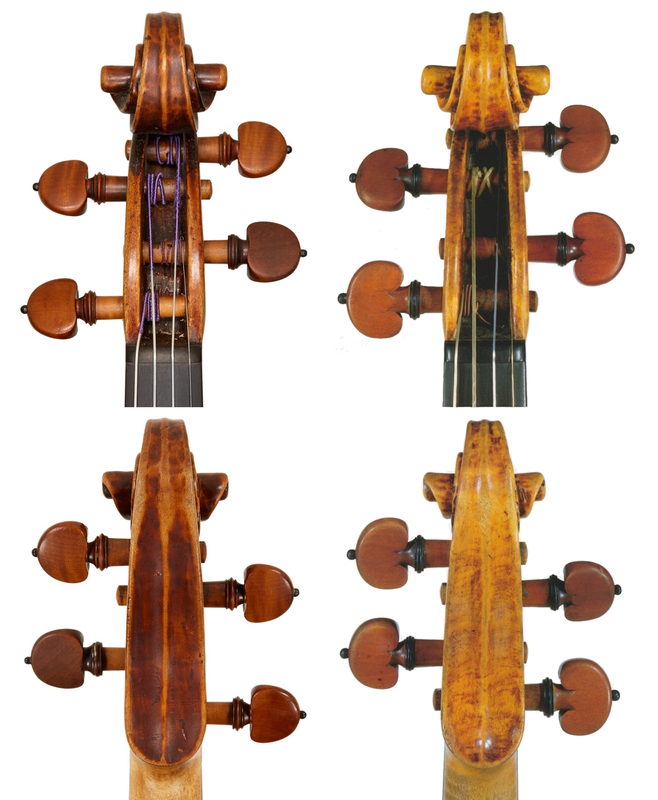 The arching of the top and back plates is relatively flat, like most Guarneri-model Vuillaumes, and has minimal fluting at the edges. When viewed from the side the soundholes lie perfectly parallel to the arching with the stem revealed as a symmetrical crescent and the upper and lower wings seemingly of equal size. The notches are small; the wings are flared and eccentrically rounded at the flat edge of each wing. The edges are delicate and narrow. The purfling is equally delicate with its center strip narrower and darker than one typically sees on Guarneri instruments. The purfling sits somewhat unsteadily in its channel in imitation of the Guarneri style. With its wide, open turns from the lateral view and its narrow, hollowed out turns from the front, the scroll is strongly reminiscent of the ‘Lord Wilton’ and the ‘Alard’, both from 1742. The slightly undercut ears make one wonder if the ‘Lord Wilton’ itself was the direct model for the head. The pegbox walls are visibly convex when viewed from the front and rear and the throat is abruptly shallow when viewed in profile. The fluting on the dorsal side is shallow and shows prominent tool-marks in imitation of the Guarneri style. Perhaps the most successful aspect of Vuillaume’s copies from this period is his careful and yet effortless antiquing. Immediately recognizable as a Vuillaume and yet showing a sophisticated familiarity with classical Italian originals, this violin is a fine example of his confident and skilful work. This violin is a recent addition to the Tarisio Trust. Read more about the ‘Sun-Law’ Vuillaume Fellowship, the story of the violin’s former owner, Eric Sun, and how to apply.